Närke | Beer Apprentice - Craft Beer News, Reviews, Interviews and Info. Hi guys. For today’s craft beer review I’m going to be trying the Haand Bryggeriet/Närke Unionöl brewed by both the Haand Bryggeriet Brewery located in Drammen, Norway and the Närke Brewery situated in Örebro, Sweden. So far I’ve really enjoyed the few brews that I’ve tried from Haand Bryggeriet, but I’ve yet to try anything from Närke therefore, I’m pretty excited about tasting this brew. I couldn’t find any info on the website, haandbryggeriet.net, nor Närke’s website, kulturbryggeri.se, so let’s just see for ourselves what this beer has to offer. This beer came in a 16.9 oz. bottle and it had an ABV of 8.5%. It poured a very dark brown color with an aesthetically pleasing purple hue when held toward a light source. The crown was off white, sized very well, smooth, but slightly fizzy. The retention time was decent, yet the lacing was a bit thin. A slight skim of alcohol was left clinging to the sides of the snifter when I tilted the liquid from side to side. It looked decent enough. The nose was very odd smelling. I gathered hints of plastic and rubber. A very deep smoke and only a very light waft of wood. That is, honestly, all I could pick out. It didn’t smell all that pleasurable to tell the truth. The overwhelming plastic and rubber aroma was a bit of a turn off. The taste wasn’t much better. Again, burnt plastic and rubber with a woody/smokey undertone. A very, very strong earthy/dirt savor was discovered and quite off putting. I struggled with it. The mouthfeel was medium bodied. Smooth, dry and a tad creamy. The carbonation was on the lower side and, surprisingly, I didn’t get any warmth from the relatively high ABV. A lot of flavor was left on the palate after the sip, although I’m not so sure that was a good thing in this regard. Well…. I didn’t much care for this beer. I couldn’t finish it. That’s not to say that others may not like it. By all means, give it a try. It wasn’t “rotten” or anything, but, to me it was just too hard to drink and it possessed characteristics that I wasn’t extremely fond of. It was just a bit too weird and maybe too advanced for me. 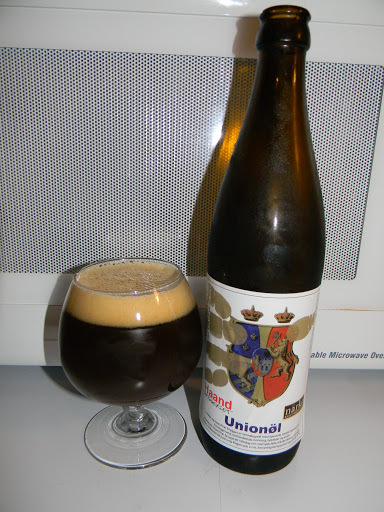 Have you guys ever tried the Haand Bryggeriet/Närke Unionöl? What was your opinion? I’d love to hear about it.